SINCE LAST NATIONAL FORUM ON JULY 25th. RIC Edinburgh continues to meet fortnightly, although we took one break in August for the holiday and Festival, Since the RIC-Scotland AGM on July 25th RIC-Edinburgh has held the following meetings. August 31st - Kimon Bukas, Antarsya - The new political situation in Greece. We now have 90 RIC card-carrying members in Edinburgh. The holiday period has led to a slackening off of activity. Members have been mainly involved in campaigns against TTIP, or the effects of the cuts in their communities and workplaces. Some have been involved in Festival Fringe events. Allan Armstrong spoke on the Edinburgh Legacy of James Connolly for the Edinburgh Peoples Festival at the Liberton 'Yes' Cafe on August 10th. RIC also held a small meeting with visitors from Catalunya in the Yes cafe on August 12th. Pat Smith was on the panel of the Common Weal Butterfly Rammy Fringe event speaking on the Indyref. Edinburgh-RIC includes members of the ISS, Greens, RCN, SNP, SSP, SWP and those in no political organisation at all. ISS, RCN and SSP members, along with others have now joined RISE. The Edinburgh launch was attended by 90 people. 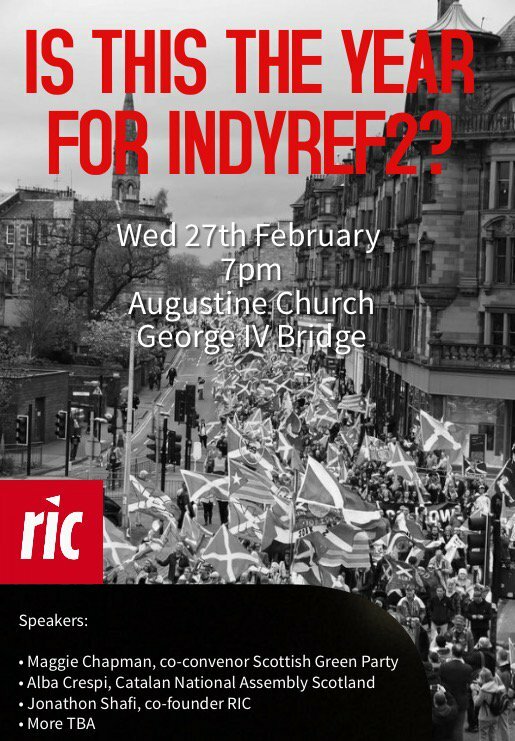 RIC-Edinburgh continues to be a coalition of people from different political organisations, various local campaigns and those who are not in other organisations.